If you have a sloped property, you will probably want to install stairs at some point. 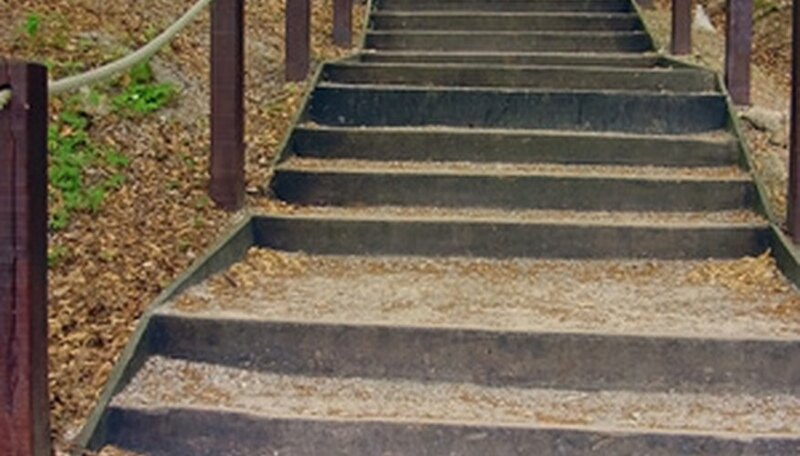 Stairs reduce the possibility of falls on slippery slopes wet with rain or snow, and they add vertical interest to the landscape as well. They also serve as outdoor shelves, providing convenient places to display flowerpots or statuary, and as impromptu seating. Stone is perhaps the most durable of all materials for use in the landscape, and makes an attractive natural backdrop for plantings. Use large natural stone blocks with level top surfaces (use a chisel to chip away any odd bumps that may trip someone). 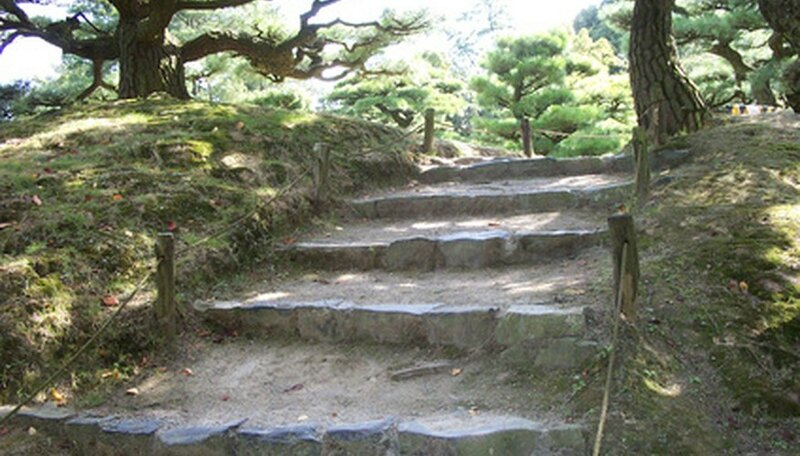 Cut low terraces into a slope and place stones to the front to create deep stairs with wide bands of soil behind them. Plant those areas with trailing ground covers like ivy to creep over and subtly soften the stone outlines. 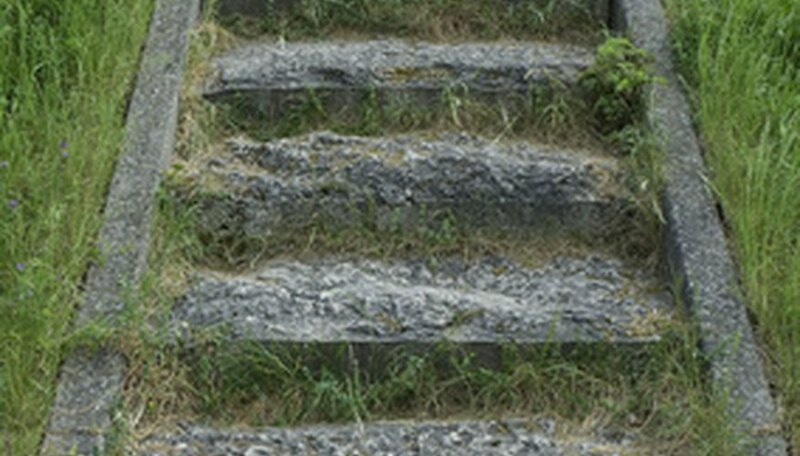 Alternatively, build shallower stairs using smaller stones set, so that soil fills spaces between them. Plant low, fragrant ground covers like thyme (Thymus vulgaris) or sweet woodruff (Galium odoratum) in the gaps. Foot traffic on the steps will release their fragrance. 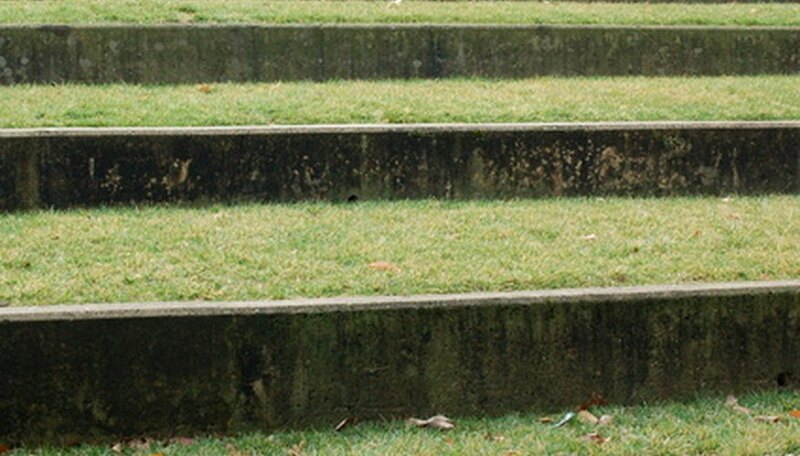 Plant mosses in the gaps instead if the stairs are in a shady location. 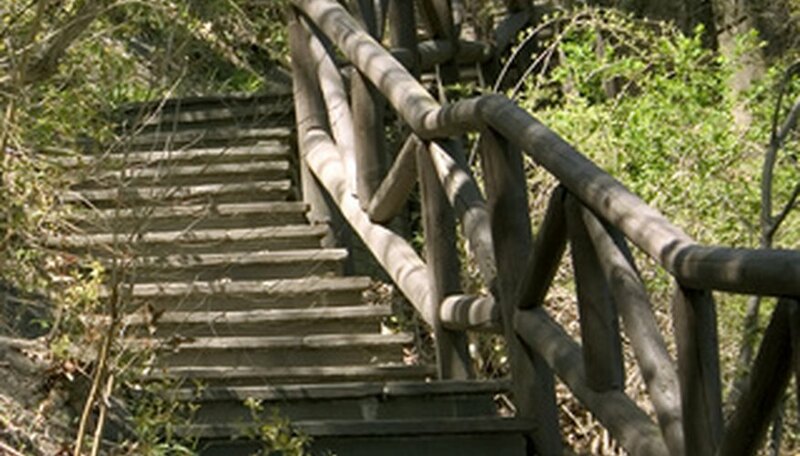 If you do not have stone, or prefer wooden steps, landscape timbers are ideal alternatives to stone. They may be used the same way, or laid together to create a solid wood surface, much like an indoor staircase. Dress them up with large terra cotta pots filled with bright red geraniums (Pelargonium spp.). Plant English ivy (Hedera helix) on slopes at the edges of the stairs for contrast with the geraniums and the weathered gray surfaces of the wood. Take one terrace to another without breaking the flow of grass or ground cover. Construct an open wooden framework of pretreated wood (use a nontoxic wood sealer) in an excavated space in a terrace wall--precisely as you would do if making ordinary concrete stairs. Fill with a damp, clay soil mixture and pack firmly in place, then cover each step with an inch or so of loose dirt and lay sod on top. Backfill around the framework and replant as it was before excavating. Only the wood riser of each step will show--from above it will appear as grassy steps descending from one terrace to the other. 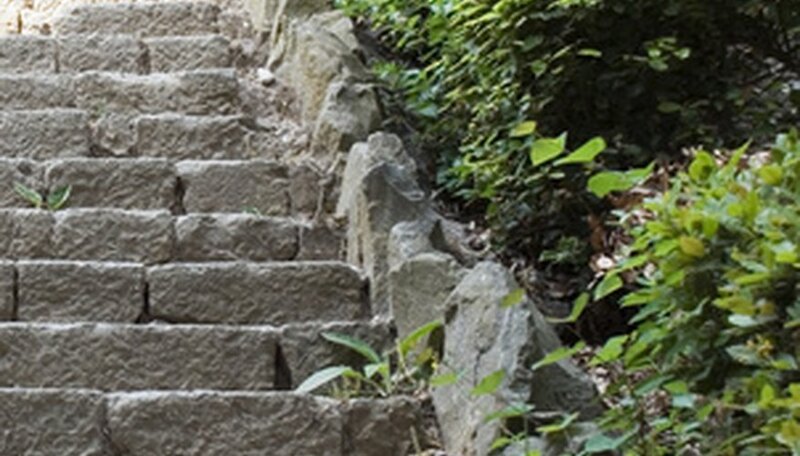 For an inexpensive makeover of existing cement stairs, fasten chicken wire over the original stairs with bolts, and then cover with "hypertufa" as suggested in "The Complete Book of Gardening" (one part cement to one part fine sand and two parts sifted peat moss). Shape the wet mix as you go, keeping the top surfaces to about 1 inch thick, so the stairs are not uncomfortable to use. After curing, drill or chip pockets in the porous hypertufa to plant mosses, lichens or low alpine plants that thrive in nearly soil-less conditions. Saxifrages are one good choice.